The expanding social safety net is part of the reason that unmarried women who are heads of household have gone back to work more slowly than married women have. 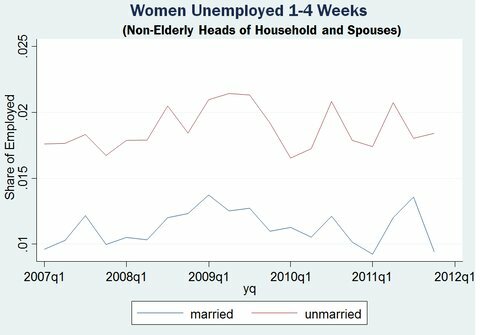 Last week I showed how employment rates fell significantly more during the recession for unmarried (and nonelderly) women who are heads of households than they did for married women. The first chart below shows how this result is probably not attributable to sharply different layoff rates by marital status, because the number of unmarried women who were in their first month of unemployment, expressed as a ratio to the number of unmarried employed women, changed essentially in parallel with the number of married women in their first month of unemployment. 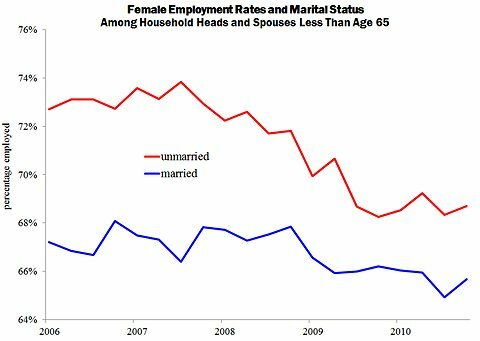 What seems to be especially different between married and unmarried women is their propensity to be unemployed for long periods. The second chart shows the number of women in their seventh month of unemployment (that is, weeks 27-30). Unemployment this long increases much more among unmarried women. A similar chart could be drawn for the eighth month, the ninth month and so on. 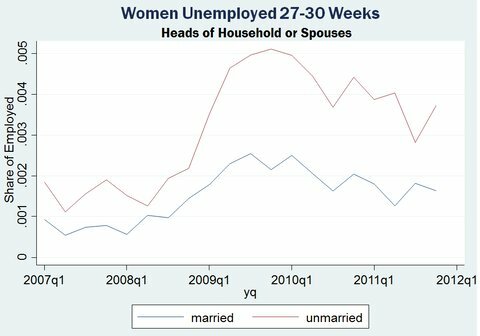 The point is that married and unmarried women enter unemployment at about the same rate, but unmarried women leave it more slowly. A few readers who commented on last week’s post suggested that unmarried women experience more discrimination than married women do, and that’s why they are slower to return to work. It would be nice to have more direct evidence on that hypothesis; for now, I note that this is the opposite kind of discrimination than what prevailed during the Great Depression, when married women were often prohibited from working while unmarried women were permitted to work. Part of the difference in labor-market experiences has to do with the safety net. Many safety-net programs, like the Supplemental Nutrition Assistance Program, which provides food stamps, and Medicaid, base eligibility on family income. An unintended but unavoidable consequence of providing someone a cushion when they are without work is that they are provided with less incentive to get back to work. By definition, married women have husbands and unmarried women do not, and husbands can many times be a source of support. But husbands can provide more flexible support than government programs do. After all, husbands know their wives better than the government does and thereby do less to discourage women from getting back to work than government benefit rules do. Note, too, that the safety net expanded during 2008 and 2009 in ways that were more accessible to unmarried women. The Supplemental Nutrition Assistance Program became more generous in a number of ways, and, as noted, it provides less cushion for the average married woman than it does for the average unmarried woman head of household. For a time, the 2009 American Recovery and Reinvestment Act paid for 65 percent of the health insurance costs for unemployed people, but only if those people could not join a spouse’s health insurance plan. Thus, as the law’s health insurance subsidy appeared and then was phased out, it had different effects on the incentives to get back to work among unmarried people than it did among married people. A great many unmarried women have been unable to find work through no fault of their own. At the same time, we know that the safety net affects the propensity of people to work. Unless incentives suddenly stopped mattering during this recession, it appears that the expanding social safety net explains some of the excess nonemployment among unmarried women who are heads of households. The payroll tax cut is having the expected labor market effects, but those effects will reverse themselves when the cuts inevitably expire. On a seasonally adjusted basis, payroll employment was 130.2 million at the end of 2010, just before the payroll tax cuts took effect. As of last month, payroll employment was up 2 percent, or 2.5 million, to 132.7 million. The household employment survey tells a similar story. Aggregate hours worked — the product of employment and the length of an average employee’s work — increased almost 3 percent. Of course, the payroll tax cut was not the only factor affecting the economy since 2010. If nothing else, population growth would have increased employment by about 1.2 million over that time frame. In addition to the increase expected from population growth, payroll employment therefore increased by another 1.3 million since the time that the payroll tax cut went into effect. During the same period, various parts of the federal government’s 2009 stimulus package expired and state and local governments were, on average, laying off employees. Housing prices also fell somewhat — more than 4 percent according to the Case-Shiller index. One point of view is that government and housing contraction tends to reduce total employment, which makes it even more remarkable that the net result of the payroll tax cut and these contractionary events was an employment increase beyond population growth. Regardless of the source of the two and a half million new jobs, employment is still millions below where it would have been if employment had grown with population since 2007. But nobody promised that a mere two-percentage-point payroll tax cut would bring the economy back all by itself. This minirecovery may not last, because the payroll tax cut will eventually expire. When that happens, the payroll tax rate increase by itself will tend to reduce employment by about a million, so that employment can increase further only if population or other sources of economic growth are enough to offset tax-cut expiration. Chicago has been in the news twice recently, once for being ranked as the most corrupt American city and this week for losing its opportunity to hold the Group of 8 economic summit meeting in May. The economics of the two events are related. A study at the University of Illinois at Chicago and the University of Illinois Institute of Government and Public Affairs found that Chicago city officials, especially aldermen, were convicted by the federal government for corrupt activities while in office more often than officials in other cities. It’s been decades since a Chicago mayor has been convicted of a crime while in office. But something has seemed different in that office too, because its holder had been named Richard Daley for 42 of the 56 years from 1955 to 2011 (first Richard J. Daley, then his son Richard M. Daley). It’s also been at least decades since a Chicago mayor sought a higher office. A promotion tournament is one way that labor economists have suggested that people can be provided incentives to behave well in their jobs, be they in the private or public sector. The idea is that people have an extra reason to do their job well when they expect to be closely evaluated on the occasion of a promotion decision. Promotions are sometimes a factor in political careers, too. Aldermen sometimes become mayors and mayors governors. Both George W. Bush and Bill Clinton were governors before being elected president. Officials are sometimes criticized for looking toward higher offices, but those aspirations might give them an extra reason to stay away from corruption, lest credible accusations of corruption mar their campaigns. Many Chicago mayors have not been expected to pursue higher office. Richard J. Daley and Harold Washington died in office. Richard M. Daley retired, and Chicagoans do not expect him to run for governor, senator or president. The current mayor, Rahm Emanuel, could be different. He is a prominent figure in the national Democratic Party. If, hypothetically, he were building a résumé for governor or another office, that could be good for Chicago. The better Chicago performs while he is mayor, the better his résumé will look. Indeed, Mayor Emanuel has already involved himself in statewide, national and international interests. He was eager to play host to the G-8; although that was moved to Camp David, Chicago will be the site of a NATO meeting this year. Mayors often concern themselves with the city’s public school system through high school. Mayor Emanuel has looked a bit presidential in tackling higher education, too.